According to The Elegant Variation, today is National Grammar Day. Birnbaum’s waxing about Zen and gardening. The L.A. Times reports on David Foster Wallace’s unconventional posthumous book deal. The Telegraph reviews Dali and I: Exposing the Dark Circus of the International Art Market. 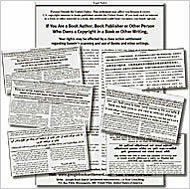 Posted in Book RateBookmark the permalink. Trackbacks are closed, but you can post a comment.